Mr. Perkins’ background consists of education/technical training and over 50 years of professional experience since 1965. After serving in the United States Navy, Mr. Perkins worked in a major municipal fire department for 28 years and retired in 1994 at the rank of captain. Mr. Perkins positions with the fire service includes fire suppression firefighter, engineer, and fire prevention officer. He also held the position of fire investigator for two years and arson unit supervisor/investigator for four years. During his time with the fire department, Mr. Perkins conducted or supervised over 3,000 fire investigations. 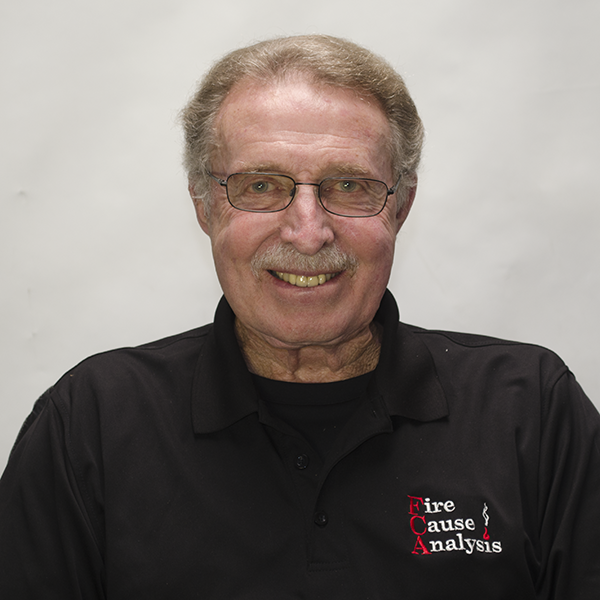 Concurrent with his work in the fire department, Mr. Perkins founded Fire Cause Analysis in 1980. In addition to conducting his own investigations and business activities, he presently manages a team of 22 highly qualified fire investigators. Throughout his career with the City of San Jose and privately as President of Fire Cause Analysis, Mr. Perkins has conducted or supervised over 6,000 fire investigations. He has over 40 years of experience in fire/arson investigations with commercial and residential property, vehicle and marine vessels, arson and fraud, and has given expert witness testimony in state and federal courts. Mr. Perkins has conducted numerous investigations in the maritime arena. His knowledge of vessels, firefighting, and fire investigations, began with his service in the USN, stationed on both nuclear and conventional submarines. He served as a reservist and Marine Casualty Investigator with the United States Coast Guard and Marine Safety Office in San Francisco for eight years. His specific duties included the investigation of numerous vessel and marine fire investigations along the west coast. Mr. Perkins regularly works with law firms and insurance professionals, providing additional services in all fire related disciplines, including Computer Modeling, Fire Testing, Fire Safety Consulting, Mechanical and Electrical Engineering and Forensic Studies. In addition to participating in yearly fire investigation seminars, Mr. Perkins maintains his education proficiency, specific to the field of fire science, and fire investigation. He has a degree in Fire Science, and has attended the National Fire Academy in Emmitsberg, Maryland, the FBI Academy in Quantico, Virginia, and the ATF Academy in Glenco, Georgia. Mr. Perkins was the Chairmen for the IAAI, CFI Testing Committee, which established and wrote the international certification test for the Certified Fire Investigator program in 1990. Mr. Perkins has been a CFI since the IAAI program origination in 1990, and a current “Pro-Board – Certified Fire Investigator” by the International Association of Arson Investigators. Mr. Perkins has a “Lifetime Teaching Credential” in the State of California and teaches the basic and advanced curriculum in fire/arson investigations in the community college system. He’s been a guest speaker & lecturer for the California Conference of Arson Investigators, International Associations of Arson Investigators, International Association of Marine Investigators, as well as various industry related conferences.